What Different Kinds of Back Pain Are There? Home / Blog / Uncategorized / What Different Kinds of Back Pain Are There? Back pain seems like it should be a fairly simple concept—your back hurts, you want it to not hurt, you go to a professional where they fix you up and send you on your way. Except, like with most things in life, and especially with your health, back pain rarely has a one-size-fits-all solution that works for everyone. Back pain is individualized, with each person having potentially distinct types of pain—dull aches or sharp pain, lower back or upper back, constant or sporadic, etc. Before you’re prepared to adequately address your back pain, you and your healthcare provider need to identify what sort of back pain it is. This involves figuring out its root cause as well as evaluating the frequency, intensity, and “feel” of the pain. To assist you in this task, here’s a breakdown of the ways that back pain is classified in determining the best avenues for treatment, as well as some potential underlying causes. The first and most basic division in types of pain is the distinction between acute, chronic, and neuropathic cases. These are categories of pain in general, but back pain can fall into any one of them and so it’s a good starting point for understanding back pain. Acute pain is the pain which is most commonly experienced by people from such causes as burns, cuts, scrapes, sharp blows, bruises, childbirth, etc. These are instances where the pain is relatively short-lived, only a few months at most, and stems directly from tissue damage. With back pain, acute pain comes from pulled muscles, injuries, and other causes. If acute back pain continues for a prolonged period of time, it can eventually turn into chronic back pain. Chronic pain is pain that has gone on for longer than three to six months or past the point of tissue healing, continuing what seems like perpetually. There are two types of chronic pain: chronic pain with an identifiable anatomical cause, and chronic pain without an anatomical cause. With back pain, potential identifiable generators of chronic back pain include ongoing conditions such as fibromyalgia, spinal stenosis, degenerative disc disease, and spondylolisthesis. Often though, there is no identifiable cause. This isn’t well understood yet, as there’s a lot about pain that we’re still figuring out, but it’s believed that prolonged constant pain can imprint itself on the nervous system. Then, even long after the injury itself has healed or the condition treated, the nervous system misfires and keeps sending pain signals through those pathways. Finally, there’s neuropathic pain. In many ways, this type of pain is similar to chronic pain that has no identifiable cause, and some even place it in that category. Neuropathic pain exists in the absence of any remaining physical musculoskeletal injury; the pain at this point is totally unconnected to any ongoing damage. However, there are ways in which neuropathic back pain is distinct from other chronic pain. For one, it stems from damage that has been inflicted on motor or sensory nerves in the peripheral nervous system, rather than from long-term pain becoming imprinted in the pathways. The major way that it differs though is in how it feels—sharp, severe, stabbing, shooting pains that can be felt travelling along the nervous pathways, as well as ongoing weakness, numbness, or tingling. These types of back pain require different treatments—neuropathic pain, for example, often isn’t helped by NSAIDs like ibuprofen or opioids like hydrocodone, and calls for a different set of treatments. There are many initial causes that may be the root of your back pain. There are a variety of structures that can undergo damage that leads to back pain. The spine contains joints, bones, and ligaments which can sustain all sorts of injury. The nerves within the spinal discs and the larger nerve roots that lead to the arms and legs can also become irritated, and the back muscles which support the spine can also be strained. Discs can wear down or rupture, and muscles can spasm or tense up under stress. Any of these problems, alone or in combination, can contribute to the development of back pain. There’s also a wide range of diseases and conditions which can cause back pain. Some of these may be familiar—you might know, for example, that arthritis (specifically osteoarthritis) is when the cartilage in your joints wears down, scoliosis is when the spine curves to one side, and pulled back muscles get inflamed, all of which are potential causes of back pain. 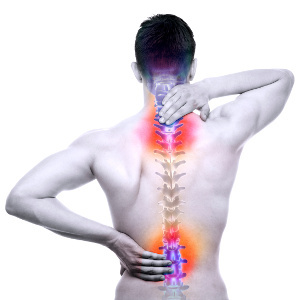 Work related injuries can also lead to pain in both the lower and upper back. Similarly, whiplash from an event like a car crash can often result in back pain. Even kidney stones, infections, and pregnancies can create a lot of back pain. Other conditions that might be the culprit are less commonly known. We touched on these briefly when discussing possible causes of chronic back pain above. Spinal stenosis, for instance, is when the spinal canal is narrowed, compressing and irritating the nerve roots. Spondylolisthesis is when a vertebral bone slips forward over another bone. 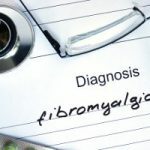 Fibromyalgia, a condition believed to be caused by some combination of genetics, trauma, and infections, is characterized by widespread muscular tenderness that can include back pain. Many other conditions can also cause back pain in ways you might not expect. Endometriosis, a condition where tissue meant to grow inside the uterus grows outside of it, results in pain that can often spread to parts of the body that include the back. As you can probably already tell, the process of figuring out the specifics of your back pain, including the type of pain, the underlying cause, and how you should proceed in terms of treatment, can all be quite complicated, as there’s such a vast number of factors that can contribute to an end result of back pain. That’s why you can’t diagnose the problem on your own. You need a qualified healthcare professional—and Back in Shape Chiropractic is just the right candidate for providing that professional evaluation and care. We’ve been treating back pain in Gurnee for nearly 30 years, and continue to be the trusted source for chiropractic treatment in the area. Simply call us at (847) 249-2225 and we’ll work with you to diagnose and treat your back pain—no matter the type.